A catalyst for carbon dioxide recycling, Mineral pentlandite may also be a conceivable alternative to expensive precious metal catalysts. This is the result of a study conducted by researchers from Ruhr-Universität Bochum (RUB), Fritz-Haber Institute Berlin and Fraunhofer Umsicht in Oberhausen. Pentlandite had previously been known as a catalyst for hydrogen production. By adding a suitable solvent, the researchers successfully utilised it to convert carbon dioxide into carbon monoxide. The latter is a common source material in the chemical industry. The research team headed by Dr. Ulf-Peter Apfel, Chair of Inorganic Chemistry I in Bochum, describes the findings together with their colleagues in the journal Chemical Science from 5 November 2018. "The conversion of CO2 into valuable source materials for the chemical industry is a promising approach to combatting climate change," says Ulf-Peter Apfel. "However, we currently don't know many cheap and readily available catalysts for CO2 reduction." Moreover, potentially suitable catalysts primarily facilitate another chemical reaction, i.e. the synthesis of hydrogen – these including pentlandite. 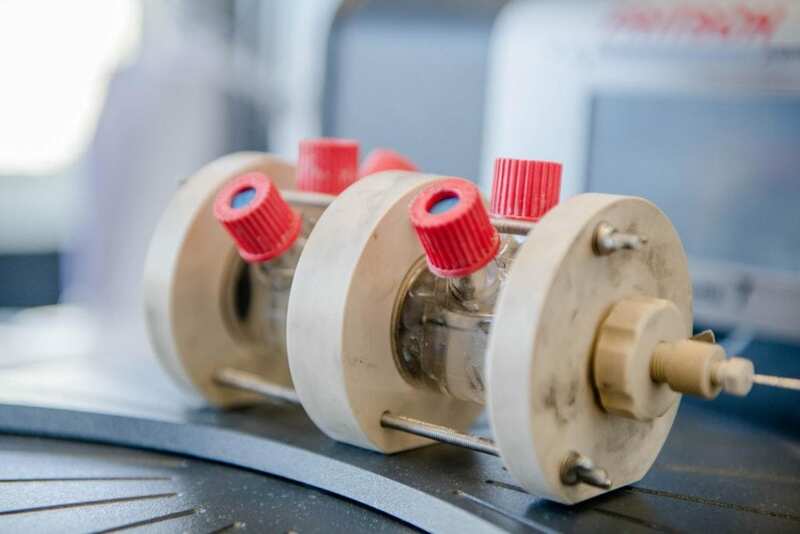 Nevertheless, the researchers have successfully converted the mineral to be a CO2 catalyst. They generated electrodes from pentlandite and analysed under which conditions production of hydrogen or carbon monoxide took place at their surface. "The decisive factor was water being present at the electrode surface," summarises Ulf-Peter Apfel. A lot of water shifted the reaction towards hydrogen production, a little water towards carbon monoxide production. By adjusting the water content, the researchers were thus able to generate carbon monoxide and hydrogen mixtures. "Synthetic gas mixtures like this one play a crucial role in the chemical industry," points out Apfel. Pentlandite consists of iron, nickel and sulphur and resembles catalytically active enzyme centres that occur in nature, such as hydrogen-producing hydrogenases. "A huge advantage of this mineral is the fact that it remains stable when confronted with other chemical compounds that occur in industrial emissions and are poison to many catalysts," explains Apfel.